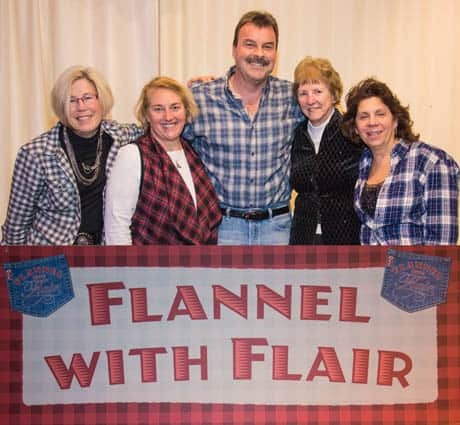 LUDLOW–On Saturday, Jan. 23, the Okemo Community Challenge (OCC) held its annual fundraiser, Flannel with Flair, at Okemo Mountain Resort’s Roundhouse at Jackson Gore. The event raised more than $60,000 for OCC through a combination of live and silent auctions and monetary contributions. Dinner was prepared by Okemo Executive Chef Scot Emerson and staff. Benevolent guests, dressed in their finest flannel, danced to the music of East Coast Soul, an award winning funk, soul, and R&B ensemble from Boston. The Okemo Community Challenge, founded in 1996, has raised close to $2 million through the generous support of residents, businesses, second-home owners and vacationers. This money is used to fund challenge grants for worthy nonprofits within the community. Some of the organizations OCC actively supports include: Ludlow schools; BRACC (the Black River Area Community Coalition); Windsor County Youth Services; Fletcher Memorial Library, the Black River Academy Museum, FOLA (Friends of the Ludlow Auditorium), the Gill Home and LPCTV community television; Ludlow Streetscapes; and the Ludlow Garden Club. OCC has also helped to fund feasibility studies on other potential projects that will add to the vitality of our community. Most of the non-profit organizations in Ludlow have been supported in some way or another by the Okemo Community Challenge, according to organizers. For more information visit okemocommunitychallenge.com.